I truly believe that you cannot go wrong giving books as holiday gifts to children. Activity books are a bonus, because they are just so much fun! Rockport Publishers has a huge variety of some amazing books that any child would love to receive. A few of my favorites are their super fun Scratch and Create books! Scratch & Create books allow your child to scratch of the dark coating on the pages of the book (with the special scratching tool provided) to reveal a fun, magical illustration underneath! These Scratch & Create books are designed for children about six years old and up. I love the idea of giving gifts that encourage a child to tap into their creativity, and does not include anything electronic! I was given the chance to review the Scratch & Create Magical Tarot Book. (I don't believe in Tarot cards or readings, but the book is still a lot of fun.) I love the cool process of scratching away until I see a really mesmerizing design. 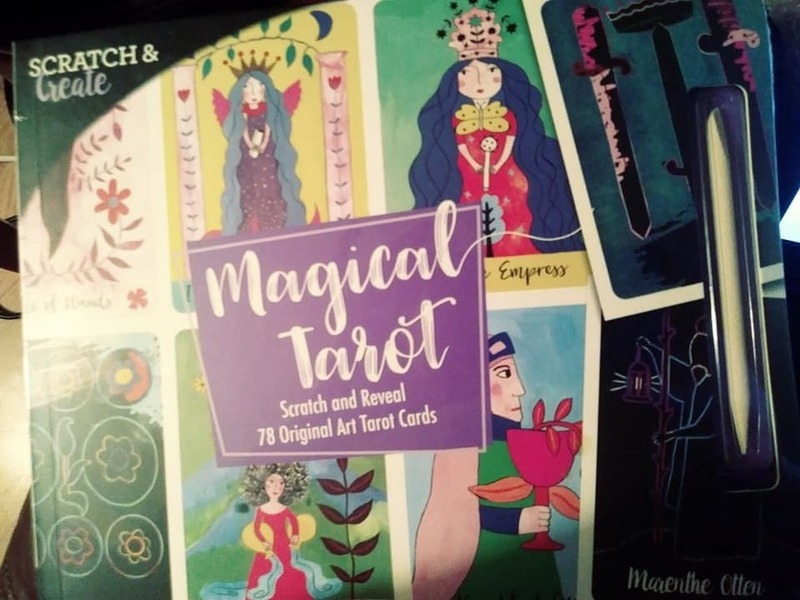 Scratch & Create Magical Tarot provides a complete 78-card tarot deck—just gently separate the cards by their perforation, then let your mind wander as you scratch off the dark coating to reveal the images of the Major and Minor Arcana in rich, colorful detail. For centuries, tarot cards have guided those seeking hope, answers, and reassurance as they navigate the twists and turns of life. Meditate on these quests as you uncover the magical illustrations of this unique deck. Each page of this Scratch & Create book includes four perforated removable cards, as well as brief details about each one. The notes include alternative names for each card, the element(s) it represents, and its key meanings. After you separate the cards, relax and be inspired as you use the specially designed tool to scratch off the dark coating to reveal the surface of each card. Relax as you watch the beautiful Tarot cards come to life, each an individually designed work of art by the illustrator Marenthe. Use this magical deck like any other, to reflect on your life as you gain insights and inspirations in matters of love, health, wealth, home life, and more. Rockport Publishers has several really fun Scratch & Create books to choose from, such as: The Wild Garden, Amazing Endangered Animals, Enchanted Forest and Folk Art Flowers to name a few. Which one do you think you would choose? Check out all of the Scratch& Create books here! How? It's easy! Just fill out the Giveaway form below. Good luck! My niece loves to scribble lol. My kids always loved all things arts and crafts! They love to color and draw all the time. I like to see my step son outside with the horses, or with the gocart. They love to color and make things out of Play-doh.